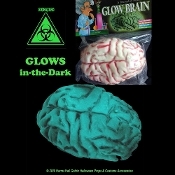 Scare your friends and prank your relatives with this realistic looking classic fake glowing brain. A triumph of mad science! Or why not serve this creepy entree as a prank, along with the snacks at your next party, and get ready for the squeamish screams. Looks ghoulishly delicious in a clear covered jar. Add water and throw in a glow stick for extra creepiness. Bright light charges this dead appearing milky white color body part, allowing it to glow bright green in the dark with no batteries needed! Slightly Smaller than Life Size 6-inch SHRUNKEN HUMAN ALIEN HYBRID BRAIN from your latest science experiment! Looks so realistic, packaged right from the Undertakers Lab! Fresh Organs from the Bloody Butcher Shop. Would look ghoulish placed in a jar or beaker as fiendishly frightening kitchen decor! Dimensional RUBBERY PVC PLASTIC Squishy Brain is no longer functioning... Disgustingly creepy addition to any zombie costume, or add to top of the head of a life size prop, or for a multitude of prop building applications. REALISTIC - SPOOKY - SCARY - GROSS PAINTED WITH MORBID Glow-in-the-Dark Detail. You can see the Brain Channels.